Facebook reactions: Is it enough to just 'like' sport? How often have you heard people say: "It's a shame they don't have a 'dislike' button? Sport can be an emotional business. 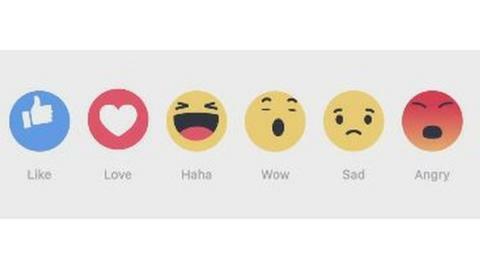 And now that Facebook has changed its iconic 'Like' button, how we react to the latest sporting news and events has been turned upside down. "Not every moment you want to share is happy," says Facebook founder Mark Zuckerberg. So, suddenly swamped with a new range of emotions - Love, Haha, Wow, Sad, and Angry - BBC Sport brings you the dos and don'ts of how to use them, and looks at how some of our stories from earlier this week would have fared with the new emoticons. Louis van Gaal's latest entertaining news conference saw him list a few qualities he expects his players to display in Thursday's Europa League last-32 second-leg tie. "Desire, hunger," said the eccentric Dutchman. "Horny". Erm, pardon? The look on Juan Mata's face next to him was priceless. Moments like this are what the Wow button were invented for. But for anyone using Haha - that's fine too. It's fine to get angry about things. The increasing cost of watching football gets us angry. Liverpool recently decided against putting up prices in a new section of their ground following protests from furious fans. So any stories about ticket prices going up - click Angry. When Barcelona president Josep Maria Bartomeu told BBC sports editor Dan Roan that he thought big clubs should be given 'wildcards' into the Champions League - even if they failed to qualify one year - we asked Sportsday readers for their thoughts, and 85% disagreed. Typical feedback: Jordan MacDonald - "What a ridiculous idea". Chris Wallace - "That's ridiculous". Paul Gilligan - "This is what is wrong with football". So Angry it is then. Don't use it to excess though. Clicking Angry when Bristol City go 1-0 down at home to Brighton will leave you with no room to manoeuvre once the fourth goes in, and the Robins miss a penalty. Barcelona are never going to need a wildcard are they? A 2-0 win over Arsenal at the Emirates all-but confirming their passage through to the next round. Poor old Mathieu Flamini. Came on as a sub and gave away a penalty 47 seconds later. No doubt that caused a bit of anger. But overall, the story of being effectively knocked out at the last-16 stage for the sixth year running made Arsenal fans sad. The rest of football simply watched Messi, Neymar and Suarez work their magic and thought 'wow'. Use Wow carefully. See it as a strong Like. Again, use sparingly or your Facebook friends will think you are in a perpetual state of surprise. If Louis van Gaal's "horny" comment was made for the Wow factor, this is what Facebook's Love button is made for - stories like that of nine-year-old Charlie Keyworth. Leicester City learned that the young Foxes fan had lost his mum to cancer and took him on an exclusive tour of the stadium. "Well played Leicester, well played," was the feedback from readers. The old Like button just wasn't enough. Friday is a hugely significant day for world football, as five men line up to replace Sepp Blatter as the head of Fifa. What do you mean "is there an 'Indifferent' button?". But what about all those other occasions when sport throws up all those different emotions? Are six emoticons really enough? We'd be interested to hear what you think.